Get a boost of energy while you work with the Bamboo Motion-X Board by UPLIFT Desk. Designed in the USA and built by expert craftsmen, the Bamboo Motion-X Board's deck is constructed from genuine bamboo that's CNC-milled and finished by hand. One of the world's most abundant and renewable resources, several layers of bamboo are fused together until the deck reaches its 5/8" thickness, which our designers have found to be the perfect thickness for supporting active standers. Take a look underneath to see the dome base, which is molded out of durable plastic to provide for invigorating and stable movement as you rock, tilt, and swivel your way to health benefits. Install the optional rubberized bumpers to give yourself additional bump protection for your board and your workstation. Then complete the setup with the 9 mm thick anti-fatigue Comfort Mat, which enables the Bamboo Motion-X Board to be used comfortably for more time on your feet. Why should I use a motion board? Motion boards are ergonomic tools that can provide you with health benefits like the abilities to burn more calories and improve your circulation. The Bamboo Motion-X Board by UPLIFT Desk helps you engage even more muscle groups than you can from merely standing by allowing you to balance, rock, and move more at your sit-stand desk. What is ergonomic about the Bamboo Motion-X Board? If building an ergonomic workstation is one of your goals, it's important to have the tools to give you the most options to move for your space and work style. Standing is just the start; what you want is more movement throughout the day, which keeps your energy levels up naturally because your body is working with optimal circulation. When you want to move more while standing, the Bamboo Motion-X Board makes it possible (and fun!). It looks like a skateboard. Is it a skateboard? 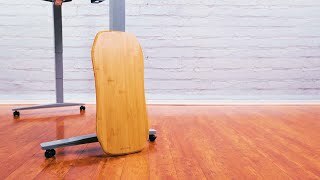 Although similar in design to a traditional skateboard deck, the Bamboo Motion-X Board's deck is thicker and has been designed to offer users the ideal balancing experience at their standing desks. Instead of wheels, this board comes with a molded plastic base, which lets the board tilt. So you won't be able to skate at your workstation, but it will feel like you're surfing! Its low-profile design makes it ideal for most workstation sizes, even compact cubicles. What do I need to know to get started moving on my board? It's easy to get moving on this beautiful board. All you have to do is set the Bamboo Motion-X Board in front of your workstation, take a single step up, and acquaint yourself with the points of balance on the board. Then step up with the other foot and space your feet about your hip's width apart, or whatever feels comfortable to you. Make sure you're holding on to a stable surface as you get used to the board for the first time. After you get the hang of balancing, try our favorite moves on this board - the Rock, the Tilt, and the Swivel. Before you know it, you'll be wrapping up spreadsheets while you surf at your desk! If your floor is made of wood, it's a good idea to have a small rug or standing mat to use underneath the board to protect it and your floors from scuffing. Our standing desk mat is a great solution. Want to stand for longer periods of time? Add a Comfort Mat to your Bamboo Motion-X Board. The mat is easily installed with an adhesive strip, which can be washed and reused. You can even use the mat with and without shoes! Stand with ample support with this cushy and comfy 9 millimeter thick mat at your feet. $89.00 List Price: $129.00* The list price is the same as the MSRP (Manufacturer's Suggested Retail Price). It may not necessarily be the price at which the product is sold.